If you are planning family vacations, we are sure you are having a lot of questions and concerns about everything you need to prepare. That’s why we’ve created this guide with some travel tips that will help you answer all those questions. First, you need to check the travel documents of the family. Be sure that passports are valid, that toddlers and teenagers don’t need special authorizations to leave the country and don’t forget to check if the country you are visiting have unusual requirements to enter such as visas or vaccinations. A useful tip is to scan passports, visas and important documents and email them to yourself. This will be very helpful if you lose any of them. One of the most useful family vacation ideas is pack smart, and this will take you some time. When you travel with children, there is a complete luggage that you have to pack and carry by yourself. That’s why you have to do it carefully, taking into account luggage weight limits. Never forget the special blankets or toys for toddlers, since these will make them feel comfortable away from home, an iPad or some books for teenagers, and medicines if any of the family members requires a special medical treatment. A very important tip is to ask your travel agent or research online about the weather of the different destinations you are visiting, as this will determine what do you need to pack. You will find incredible family vacation packages to the most exotic destinations if you look on Internet, but it’s important to take into account that flights over 5 hours are not convenient for toddlers or seniors. We recommend you to get flights with one stop, usually airlines make stops around one to two hours that toddlers and seniors can have a spare time out of a plane. Also the airplane ticket will be cheaper than non-stop flights. Look for affordable affordable family vacation spots, plan your itinerary avoiding long road trips and if you do try to arrange with your travel agency a hotel in order to rest. Compare distances between one destination and other, and also consider booking local flights instead doing some road trips. Domestic flights can help you save some valuable time, which instead can be enjoyed in the pool or the beach. It is also important to consider what airport in the country is the best alternative for you. Sometimes it will be better to use a specific airport to avoid long transfers from the airport to the hotel, or vice versa. In case you can’t avoid long flights and road trips, then prepare easy travel games to entertain toddlers on airplanes and cars. For example, making a colorful map of the journey is something a lot of parents do. Together you can track the map looking for different treasures. As we mentioned before, packing medicines is very important if one of the family members is taking a special treatment or if anyone has allergies, for example. Sometimes, you will not find the same medicine in a foreign country or depending the destination you are visiting, find a drugstore will be not as simply as it sounds. It is very important to pack medicines in the right way, taking into account the limitations of the airlines. You have to be sure that the specific medicine is legal in the country you are visiting, and how much medication you can take with you. Besides, always remember to take medications in their original containers, with the corresponding recipe; this way they will be better protected from humidity and light. When you travel with kids, pack and unpack it’s hard work. The best thing you can do to enjoy your holidays and truly spend some relaxing time is stay longer in each destination. Changing hotels every day will be annoying for the whole family, specially for the person in charge of the luggage of the children. Our recommendation is to stay at least two nights in each hotel, this will give you the opportunity to enjoy the facilities of the hotel and do some tours without rushing. 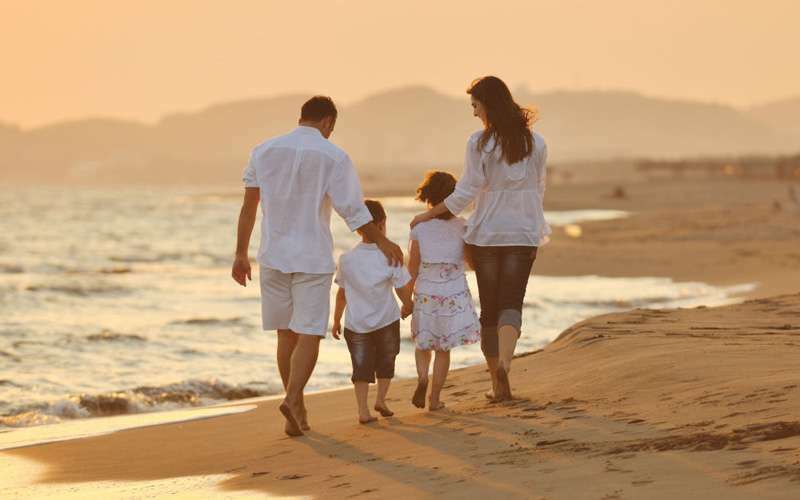 All-inclusive family vacations are a great option, especially if you are traveling with a big family because this means that you don’t have to worry about what are you are going to eat and where. Everyone can have what they want, when they want it!. All inclusive resorts are perfect for families. Also, renting a villa is a good idea if you are planning to stay your whole holiday in the same place. This is very used for family beach vacations, and sometimes you will have the option to include a private chef and a private butler to help you with everything you need during your stay. Most of the family resorts have free activities included, and taking advantage of them is a good idea when you are traveling on a budget. For example, and depending on the hotel, there can be self-guided hikes, aerobics or yoga classes or children’s clubs included; and all of these activities can help you have some funny family time without spending money. Besides, you can search on internet, ask at the front desk of the hotel or your travel agent, about free stuff to do in the city where you are. Local fairs, concerts or even city tours are available sometimes, and this can give a special touch to your holidays. Interacting with local people may be a good life-lesson for children. Be sure to enjoy the places and attractions around you, without worrying if you are taking the perfect photo. Our recommendation to capture every moment is to have something to show the kids a few years later. Sometimes we visit amazing places with toddlers, and after some years we ask them about the trip and they don’t have memories about it. Nowadays, is very easy to capture moments with cell phones or small cameras, so this doesn’t have to be a big concern. Renting a car is not for everyone, but depending on the place you are visiting can be a really good idea to control your timing. When traveling with kids, sometimes can be difficult to be ready at specific hours to take a bus or a transportation, so renting a car can give you the control of that. Of course, you have to feel safe driving in a foreign country and be sure you meet all requirements to do it. Besides, you have to obey special laws about baby seats or boosters that may mean extra costs. Last but no least, it is very important to plan something for everyone. It’s not fair to plan family holidays without taking the opinion of all family members. Of course, it is not possible to please every request, but it is possible to agree in general terms. For example, you can look for destinations or hotels with fun activities for teenagers that also offer kids clubs. Or you can book activities such as canopy tour or white water rafting tours for the most adventurous members of the family while others stay in the hotel having fun in the beach or the pool. Also, you can plan activities you can do together. Some no-cost beach games like making sand castles or a pond, play frisbee or pick seashells, are things the whole family will enjoy. The idea is that all can take home unforgettable memories. I love the tip you gave about not changing hotels frequently and to stay at least two nights in each hotel. I've heard that kids prefer when you can stay in just one hotel because it allows them to get comfortable in their surroundings. I'll have to keep these great considerations in mind as we try to choose a great hotel and vacation destination for our next family vacation.